There are some great attractions and shows at Disneyland, including some thrilling rides. If you'll be spending the good portion of the day at the parks, you'll want to get something to eat. There are plenty of quick-service restaurants at Disneyland at which you could just show up and hope for the best when it's time to grab a bite during your visit. But there are some fabulous places to dine throughout the resort, and you'll probably want to try at least one table-service meal. The problem is, there are gazillions of other Disneyland visitors who also want to nab a table at the more popular eateries. So, you should really make restaurant reservations, preferably well in advance. Here's how. Online: To book a table, go to Disneyland's official site, click on a restaurant that accepts reservations (you can filter by that option at the top under "dining experience"), and enter your info in the "Check Availability" box on the restaurant's page. As with all other ways to make advance plans, online dining requests can only be made up to 60 days ahead of your visit. Disney will send you an email confirmation. You can also check your confirmation by going to the "My Reservations" section of your online Disney profile. If you do not have a Disney account, you'll need to create one at the Disneyland site before you can make a reservation. Call up to 60 days (2 months) in advance—the sooner the better, especially during busy seasons. Note that when you make a reservation by phone, Disney will NOT send you an email confirmation, nor would you find the confirmation in the My Reservations section of your Disney account. Hotel guests: If you will be staying at one of the three Disneyland hotels, you may be able to make a preferred reservation. 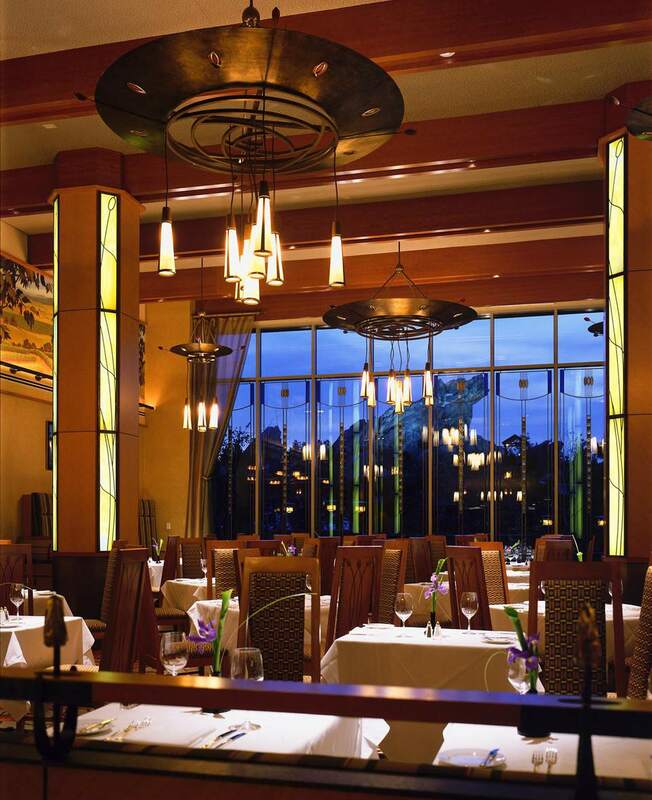 Select restaurants, including (but not limited to) Blue Bayou, Carthay Circle Restaurant, and Napa Rose, set aside a limited number of seatings for hotel guests. To make a reservation, call Disney Dining at (714) 781-3463 as much as 60 days in advance but no fewer than two days in advance of your stay. More info about preferred access reservations is available at Disneyland's site. On property: If you are staying at one of Disneyland's hotels, you could try making day-of or advance reservations with the concierge. If you are visiting the resort, you could try walking up to a restaurant that accepts reservations on the day you want to dine. Last-minute cancellations do occur, and even the busiest eateries may be able to accommodate you (although it is unlikely, especially at the more sought-after places and/or during peak seasons). Consider booking a dining package. You could reserve a table at a restaurant and reserve a spot to see one of the parks' parades or nighttime shows. For example, you could book a World of Color dining package at restaurants that include Wine Country Trattoria and Carthay Circle Restaurant. It would guarantee you a preferred spot to see the World of Color show on the evening of your restaurant visit. You can only request reservations at certain table-service restaurants. You are on your own at quick-service eateries and lounges. To find out which locations you could book in advance, go to Disneyland's official restaurant page and filter by "Reservations Accepted" under the Dining Experiences tab. Note that you will need a credit card to make a dining reservation. Note also that your card will be charged a fee if you do not cancel the reservation. Consider exploring some of the wonderful restaurants available outside of the parks at the hotels and Downtown Disney. You might want to scoot out of the parks during the lunch-hour rush and seek an alternate place to dine. Be persistent. If you have your heart (stomach?) set on a particular restaurant, but a reservation isn't available, wait a few days and check back. You may be successful later, because cancellations can occur. Particularly during high-demand days, try booking during quieter times, such as a late lunch or an early or late dinner. Disneyland character dining can be especially popular, so be sure to make reservations early if you and your gang want to eat with Mickey and the gang. Are you looking for suggestions about places to dine? Check out my lists of Disneyland's Best Restaurants. Discover the top 10 best Disneyland table-service restaurants. Some of these accept reservations. You can also take a look at my rundown of the top 10 best Disneyland and Disneyland's top-10 best snacks and desserts. Which Disneyland Restaurants Offer Character Dining?